This week's tablehopper: in the weeds. 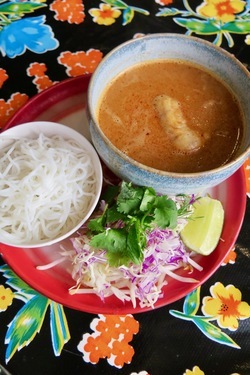 Dream lunch: kanom jeen fish curry at Funky Elephant in Berkeley. Photo: © tablehopper.com. Howdy peeps! Could you believe that eclipse and super blood wolf moon on Sunday night? Wowza. Don’t miss the moonrise over the city tonight if you can catch it, last night it was spectacular. I’m keeping today’s intro super short, someone is running so late with this column today! There were other stories I was hoping to write today, but sometimes you just gotta call it. TIME! I was away for a retreat over the weekend, and was trying to slowly ease into this short week, but sadly the pile of emails in my inbox and other deadlines really don’t care! Where’s the off switch? But I also have a bunch of food news and bites for you to track down in my weekly Table Talk column over at KQED Bay Area Bites! Last week’s post has a look at the food and drink at Obispo on 24th Street (bring on the rum and grilled chicken), and you can warm up with bone marrow ramen at Ushi Taro, plus there are two pop-up events: one with roasted pig (Prubechu is hosting it again this weekend, FYI!) and a wagyu tasting menu at Avery this week as well. This week’s Table Talk post features two places for khao mun gai (whether you’re in SF or the 510! ), plus deals for SF Restaurant Week, check out the Peruvian tasting menu at JORA, and the Pencils for Kids fundraiser next Thursday (which has great new restaurant partners, like Liholiho Yacht Club and ONE65)! I’ll be posting more updates on cool things on @tablehopper later this week… Catch ya on the flip side!